Why is Printer Toner Called Toner? Ah, toner! No one loves you more than we do. But we have to ask, how did toner get its name…and do you have any old toner you’d like to sell us? Like so many words in the English language the etymology of the word “toner” has a long, twisted past. But digging into history reveals the obscure origins of this now commonplace word. Come on! You know what toner is! It’s that colored dust that laser printers and copiers use to make prints. In short, it’s bits of plastic that get melted and fused to the paper through a printer or photocopier’s heated fuser and pressure roller. Prior to 1984, toner came loose in bottles, and needed to be poured into your copy machine’s reservoir to refill. After 1984, most toner is sold in sealed cartridges. Surplus toner and unused toner for HP laser printers and other major brands can be resold. Toners generally come in four colors — CMYK. Cyan is blue, magenta is red, yellow is yellow, and black is designated as K (because calling it “B” might confuse people into thinking it’s blue). Toner never expires, and you can sell it to a toner buyback company for cash. But Why Is Toner Called Toner? An stringent liquid applied to the skin to reduce oiliness and improve its condition, i.e. a facial toner. A device or exercise for making a specified part of the body firmer or stronger, i.e. a tummy toner. A black or colored powdered in the the xerographic copy processes. Ah, there it is! That last definition is the one we’re looking for. This is the oldest definition of toner, predating skin care and exercise products by nearly 50 years. You might also see toner used when describing photo developing, like, “We used sepia toners to give this photo an aged appearance.” But what does it mean? Where did it come from? Based on the above definitions of tone, toner, therefore would be “a thing that tones or is a source of tones.” More specifically, toner adds lights, darks, and color combinations to images. Toner brings the tone, and without tone, our world would be very dull indeed. Determining word origins is never easy, but hacking through the linguistic jungle can lead you back to the original source. 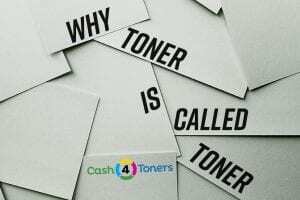 In the case of toner, the root word tone can be traced back to tonus, the Latin word for “sound or tone.” Over time, tone’s meaning expanded to include visual impressions, atmosphere, and mood in addition to musical notes. And, when manufacturers needed a name for the electrically charged dust needed to complete the electro-photostatic process that takes place inside photocopiers and laser printers, toner became the obvious choice…and our first love!